100% analog spring reverb, a single output and is fully compatible with any guitar amp on the market. From surf to jazz and everything in-between, no other reverb comes close. 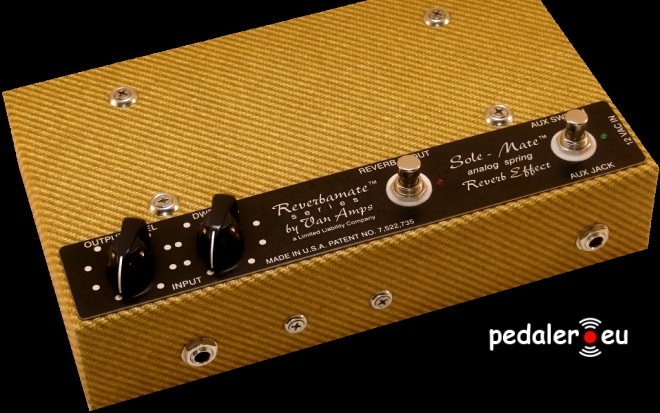 Those who have a one input amp and want the sparkling reverb effect that the Sole-Mate is famous for can now claim that awesome reverb tone for their very own. The Sole Mates circuit design negate spickup loading in both the effected and bypass mode. Our patented Tru-Out circuitry assures guitar toneintegrity by adhering strict parameters of guitar preamp design. Employs a bipolar fully regulated power supply for increased headroom and low noise operation. The Sole-Mate is a true bypass effect and fully buffered against loading, you get your true guitar sound unaltered at the output, no rolled off highs or changes in level - Just the way you want it. Someone at Sam Ash asked John Scofield to play a traditional blues, so he did. The guitar he is playing in the video is his own that he brought with him to the store - 00:59 Scofield kicks in the Sole-Mate Reverb. I think this clip really capture the essence of many things. First review for the Vanamps Sole-mate. Shipped very quickly, bought sunday, ..